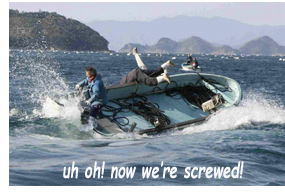 Back in the days when I was running my Corp, my partner was the anchor and I was always the one standing up in the boat. When someone stands up in the boat everyone else shouts, “Sit down, you’re rocking the boat!” Why? Because when the boat is rocked in any company, Corp or creative project, people have to “snap out of it” and start doing things. And when things start happening choices and decisions have to be made. And when decisions are made, forward motion accelerates and often, extraordinary results get produced. If your company, Corp or creative project is just cruising along in still waters, waiting for something to happen, perhaps it’s time to stand up in the boat!